Now as many of you know I'm never one to pass up on a bargain! And the other day I picked up a huge 15kg bag of carrots for £3. Bargain! 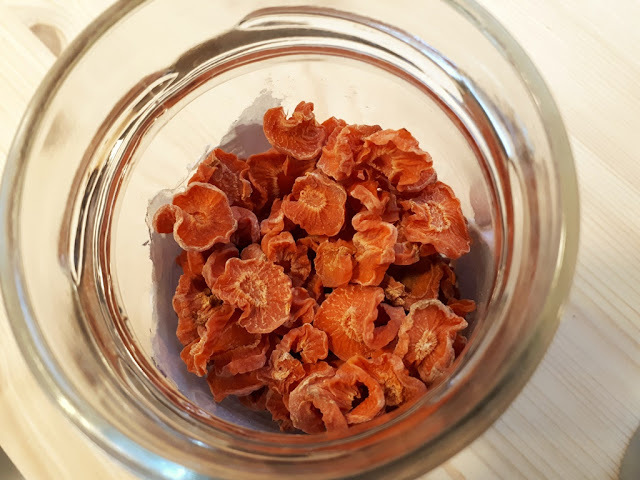 Now I must confess this isn't at the supermarket, instead I got these from the animal feed store local to us. These carrots come from the same field as the supermarket ones, just down graded as they're bent or broken. No farmer plants a field and thinks, I'll treat these differently because they're just for horses, they want them to all grade well! The main reason for buying such a big bag was because we were doing a skills evening with our Beaver Scouts and veg peeling was to be one of the skills. So I got a lot of these peeled on one night and needed to do something with them quickly. 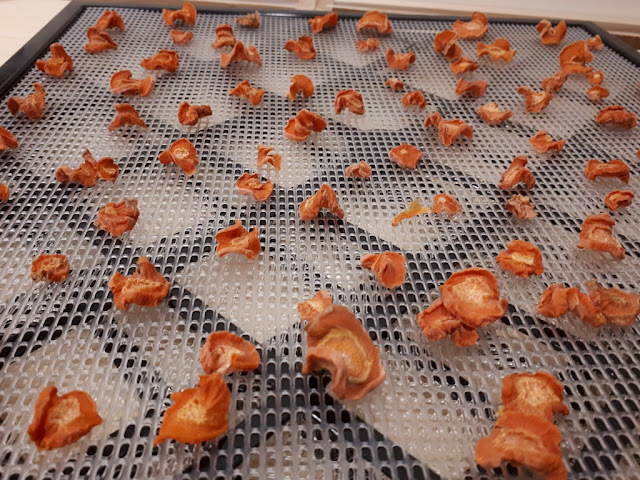 Besides having them as a veg for every meal this week I also got the dehydrator on and set to filling the trays with them. An evening spent slicing carrots rewarded me with a veg that I can store for a long time with no risk of spoilage and doesn't take up much space. 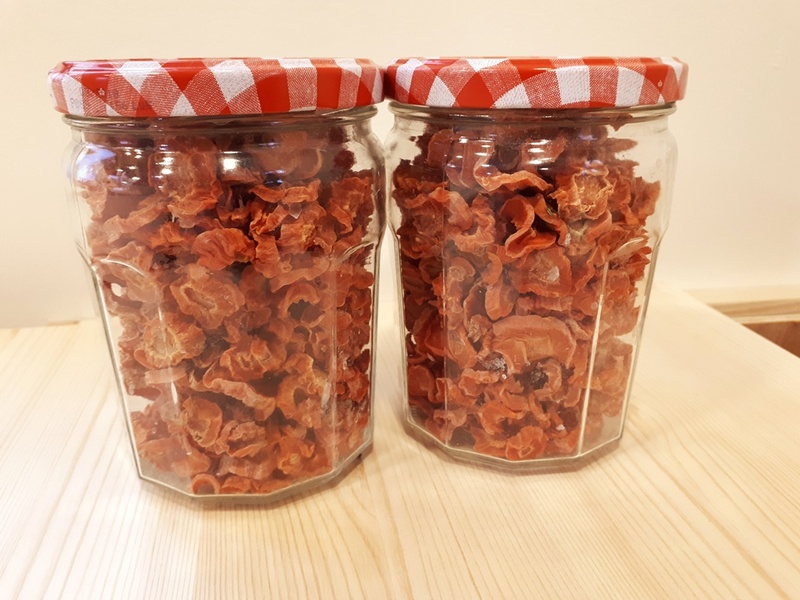 Only two and a half jars which doesn't look much, but many, many meals when rehydrated. You'd struggle to tell the difference when added to stews and soups. 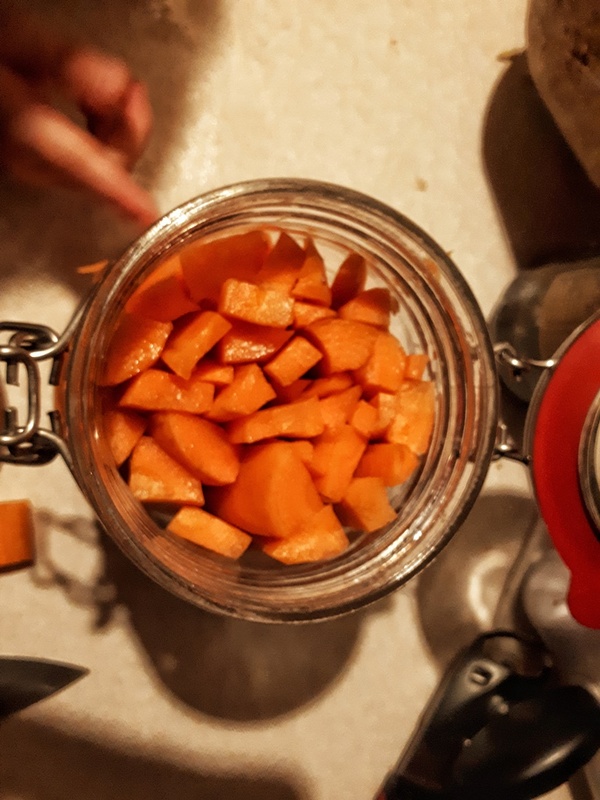 I'm also experimenting with fermented carrot sticks as snacks for the kids (and the wife and me) to see what they're like. I really want to get into fermenting more so I'm going to try a few recipes when ever I have extra veg going spare. I'll let you know how we get on with these when we try them in a week or so. 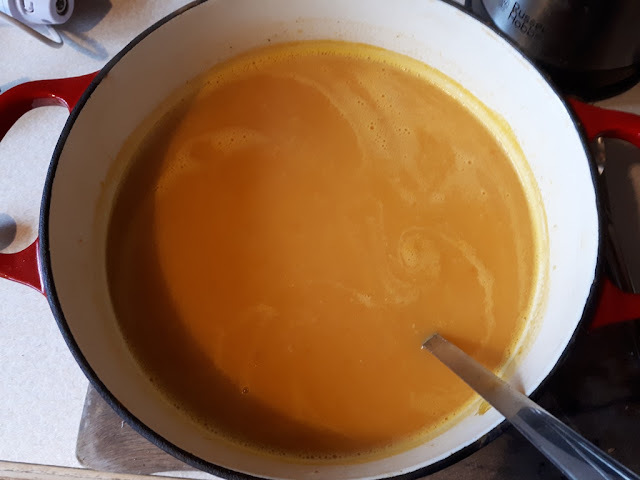 A big batch of soup was also made with the last few carrots. I had friends over for lunch [Friday] and cooked this on our new wood stove as well as a batch of rolls in the oven below. There was enough soup left over to freeze a couple of portions for a couple of healthy lunches in the coming weeks. 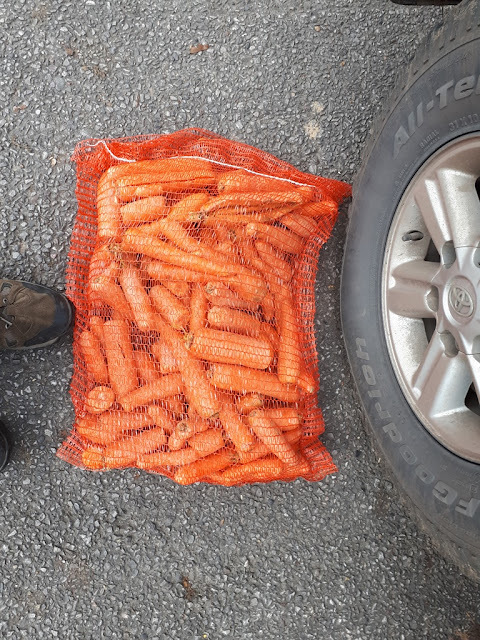 What would you do with a big bag of carrots like this? P.S. Can't believe I forgot to make carrot cake! SWell, I got my 25kg:a few weeks ago... I have made (so far, there is still some left): curry, chili, soup, pizza (cooked carrots chopped as topping), several tomato based sauces, dehydrated, eaten as carrot sticks, kaleslaw, chopped into a stew - kids don't like carrot cake so I have left that out for now. My kids will eat together at least hal a kilo per sitting of carrot sticks. Also our dog eat shopped uncooked carrots, so it's been really a great gift. Yeah, mine will do anything for a carrot stick! We've got through the bag in the week but I'll pick up another tomorrow! Just good value food really and a great way o feed lots of children! Our goats used to love it when I bought a bag of stock feed carrots! This looks a great one to try! If I get chance I'm going to have to make this. My chutney supplies are running low as I've not made any this year. 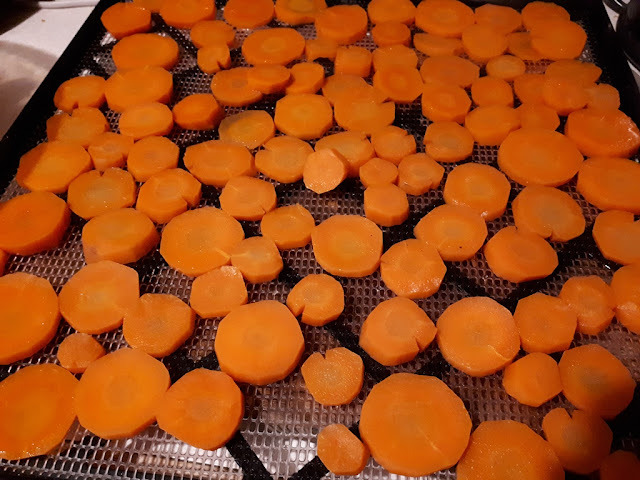 I love carrots especially roasted instead of potatoes. Looking forward to fermenting posts. I love them roasted as well! my youngest would just eat a plateful if we'd let him!